September 25 marked National Teach Ag Day, and in conjunction with the celebration, Cenex Harvest States announced its commitment to support agricultural education across the nation through a three-year gift of $1.5 million. In an age that pressures teachers to have their students reach high scores in standardized testing, an extracurricular class like agricultural education has been deemed unnecessary in many school districts, with many getting cut completely. But for those who are lucky enough to enroll in an agricultural education class, it's so much more than what meets the eye. "CHS is committed to helping create a strong future and strong future leaders for rural America," said William Nelson, president of the CHS Foundation. "We are proud to carry out this commitment by supporting programs like FFA and National Teach Ag campaign, both of which do exceptional work in developing leadership potential for the next generation through agricultural education. Nelson said that after supporting the National Teach Ag Campaign's efforts for the past two years, the time was right to make a strong statement about their commitment to this project. "A portion of the $1.5 million commitment to National FFA will be designated for the National Teach Ag Campaign, which seeks to attract more people to ag education and retain existing ag teachers," said Nelson. "We are committed to ensuring our communities have strong ag programs – and we know that strong ag programs start with quality teachers." FFA focuses on classroom instruction, hands-on learning and leadership. According to Molly Ball, National FFA Foundation president, the hands-on aspect sets up students for future success. "Agricultural education is so vitally important," said Ball. "What makes it unique is the three-tiered model that gets kids engaged in learning in the classroom, with their Supervised Agricultural Experience and through FFA." For example, a young person who takes an animal science class in high school learns the ins and outs of livestock production in the classroom. That individual then takes what they have learned in lecture and puts that information to use in FFA, through livestock judging, land judging, salesmanship and marketing contests. The skills gained are then applied to the student's (SAE), which allows the individual to have a viable business — whether it be livestock or woodworking — and have the savvy to produce the end product, while keeping balance sheet and marketing to customers. Established in 2011, the National Teach Ag Campaign is an initiative to raise awareness of the need for more agricultural educators and to celebrate their everyday successes. The campaign focuses on recruitment and retention of these great ag teachers, which is something the FFA needs to survive, said Ball. 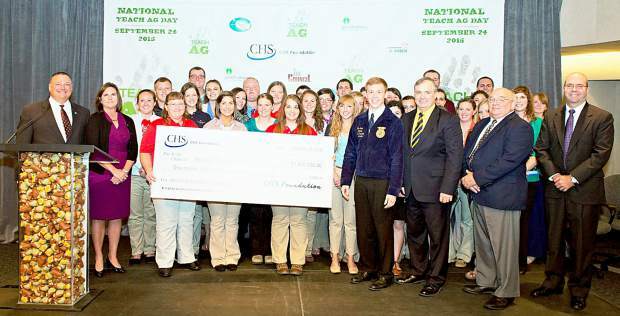 CHS has been a sponsor of the National Teach Ag Campaign since 2011, contributing more than $450,000. The campaign is a project of the National Council for Agricultural Education, led by the National Association of Agricultural Educators. It is funded by CHS, DuPont Pioneer and Growth Energy, as a special project of the National FFA Foundation. "The National Teach Ag Campaign is an exciting new project of the National FFA Foundation that is trying to address the teacher shortage and how we can support agricultural educators," said Ball. "We are trying to educate our high school kids about the opportunities in this career field. Our ag teachers work really hard – harder than most. They have classes, labs, and FFA activities, which leads to long hours and late nights." As part of National Teach Ag Day, CHS made the announcement of the $1.5 million gift at CHS headquarters in Inver Grove Heights, Minnesota, Sept. 25. "To me as an FFA member, it's inspiring to know that an organization as big as CHS believes in what we do," said Jason Wetzler, National FFA Western Region Vice President. "Our FFA membership ranges in age group from 12 to 21 and knowing that they believe in the potential we have as youth enough to make a 1.5 million investment is pretty cool. I know our generation as a whole can be somewhat disappointing at first glance in how kids can act sometimes, but the group of kids CHS has invested in will make them proud. I want to thank CHS for such a big donation. It really means a lot to the future of agricultural education in our classrooms." Wetzler recalled a favorite memory of his time in the agricultural classroom. "My favorite memory about being in the agricultural classroom was being in class with a kid named Mikey, who had severe Asperger's Syndrome," said Wetzler. "Literally, he had never talked to anyone besides his parents and his therapist. After being in the class for four months, he gave a speech in front of 500 people. Ag education made such an impact for Mikey. He went from going to therapy six days per week to only going once each week for maintenance. He credits his ag teacher for encouraging him, giving him a place where he belonged and encouraging other students to befriend him. There are life-changing things that happen in the classroom; you just kind of have to see it for yourself." Wetzler also looks at the big picture when it comes to investing in agricultural education, and believes today's youth will feed the world in the future. "If we look at it from a 30,000 foot view, we've got to feed people to educate them, and we need to educate people to produce food," said Wetzler. "People need to eat. Agricultural education is just as important as math or science. School officials are starting to realize that, but it's still a work in progress." The National Teach Ag Campaign makes teaching agriculture cool again, said Wetzler. "Both of my parents were ag-ed teachers, so I know it's a lot of work, with long hours and not great pay," he said. "But the campaign makes it appealing from a student perspective; it really helps recruit and retain our ag teachers. I can't thank CHS enough for the support." "I don't think 'thank you' is enough to CHS for what they are doing to support ag and ag education," added Ball. "Without their support, investment and time, we wouldn't be able to do what we do."